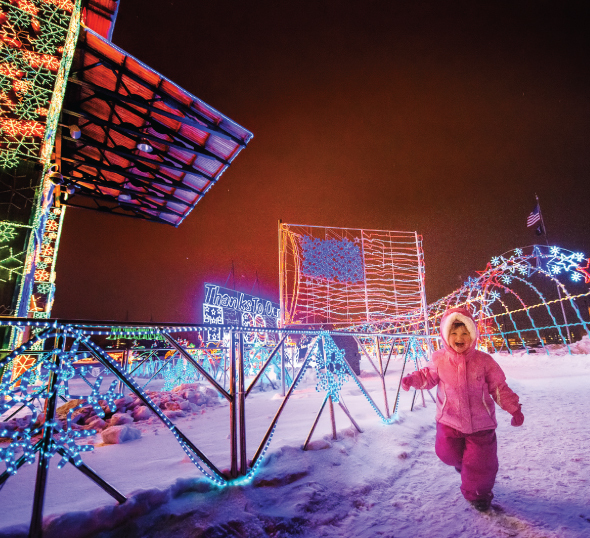 Home Sponsored 18 Fun Minnesota Winter Activities and Holiday Festivals For Kids and Adults. 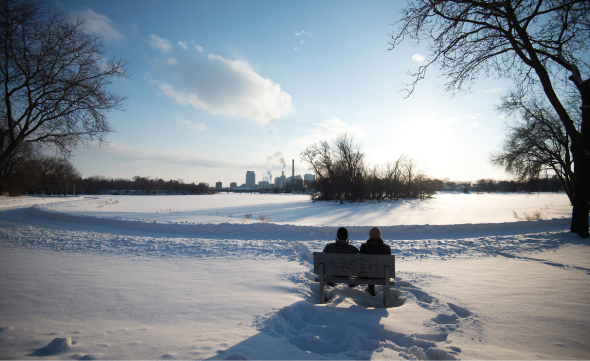 When you live in the Midwest, it can be tempting to hibernate when the snow and cold hit. Instead, seize the deep freeze! 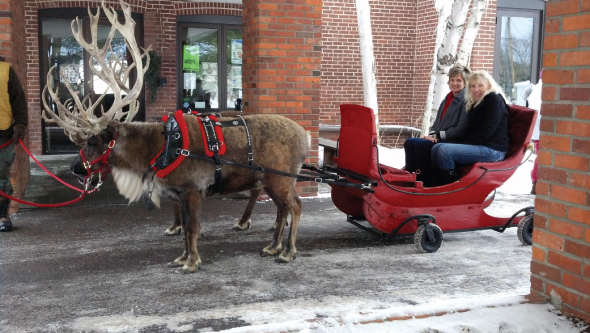 See Minnesota from the vantage point of a dogsled, on cross-country skis, or in a horse-drawn sleigh. Plan a cozy getaway to a remote lodge. Party on the ice. Go shopping in an open-air market. According to an old Scandinavian saying, “There’s no such thing as bad weather, only inappropriate clothing,” so put on those extra layers and make the most of winter. 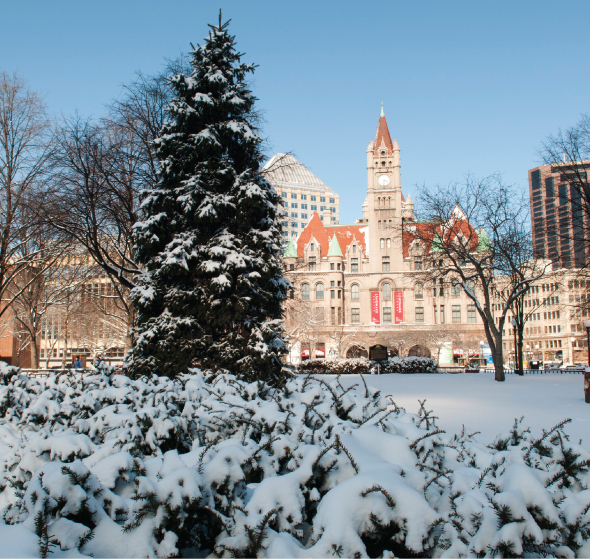 Here are 18 fun winter activities and holiday festivals for kids and adults. When the snow flies, the town of Bemidji comes alive with the roar of snowmobiles. The sense of excitement that comes with riding well-marked wilderness trails, that freeing feeling you get on a wide-open landscape, the surge of adrenaline that comes with hitting the throttle and just going, it’s all part of the appeal of snowmobiling in the “first city on the Mississippi.” Bemidji, the crossroads city for two of the major Minnesota Interconnecting Trail System (MITS) routes, can connect riders with nearly any place in the state. According to Visit Bemidji, “The MITS-71 actually consists of two major trails, the Paul Bunyan Trail, running 100 miles between Bemidji and Brainerd, and the Blue Ox Trail, running 110 miles north from Bemidji to International Falls, Winnipeg and beyond.” Combined, the Paul Bunyan/Blue Ox network is considered the longest rail-conversion-to-recreation trail in America. Less than 12 miles of trails are stud-restricted, with easily accessible alternative routes arranged. Lodging options span from full-service hotels to cozy lakeside cabins, with a variety of bars and restaurants for every taste and budget. The fish bite like crazy in summer and winter in the beautiful Lake of the Woods area of Minnesota, just minutes from the Canadian border. When the massive lake freezes over, serious fishermen/women are greeted with wide, well-maintained, flagged ice roads and the opportunity to catch walleye, sauger, and huge northern pike. (There’s a reason, after all, that the Minnesota Department of Natural Resources has determined this to be a World-Class Fishery.) Stay in a modern, reasonably priced cabin, some offering ice fishing packages with heated fish houses, hot lunch, and someone to clean and pack your fish. Marked snowmobile trails offer additional hours of entertainment. For half a century, Detroit Mountain was a family-owned alpine ski operation in the Detroit Lakes area, providing hours of fun for both residents and visitors alike. In 2004, the operation shut down, much to the disappointment of the community. Intent on finding a way to reopen the area as a year-round recreational facility, a community campaign was launched to “Bring Back Detroit Mountain.” Ten years and $8 million in donations later, the mountain will open this November. The area features a beautiful new lodge and redesigned mountain for skiing and snowboarding, as well as an all-new Scheels terrain park, tubing hill, and cross-country ski trails. In the warmer months, visitors can hike to a special scenic outlook or mountain bike along purpose-built trails. The Detroit Lakes area offers several lodging, shopping, dining, and nightlife options. “Art and history” may not be the first words that come to mind when you think of northwest Minnesota, but Moorhead is working hard to change that stereotype. Situated just across the Red River from Fargo, North Dakota—about a 3.5-hour drive from the Twin Cities—Moorhead is home to the Rourke Art Museum, showcasing regional and local art as well as national and international names, and The Hjemkomst Center multi-use facility, home to the Clay County Historical Society. The Hjemkomst Center features a 76-foot-tall, hand-built replica Viking ship that successfully sailed from Duluth to Norway in 1982, and a World War II exhibit, on display through December 2015. 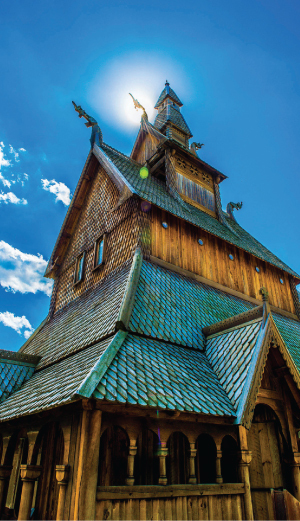 Across the way, there’s a full-scale replica of the Hopperstad Church of Vik, as seen in Norway (originally believed to be built around the year 1130). The Center hosts a number of ethnic festivals throughout the year, including the Celtic Festival in March. Moorhead is a fun place to stay, with the energy of a thriving college town, lively nightlife, and numerous hotels and restaurants. With more than 100 inches of annual snowfall, Cook County is a great place to blaze a path on cross-country skis in Minnesota. 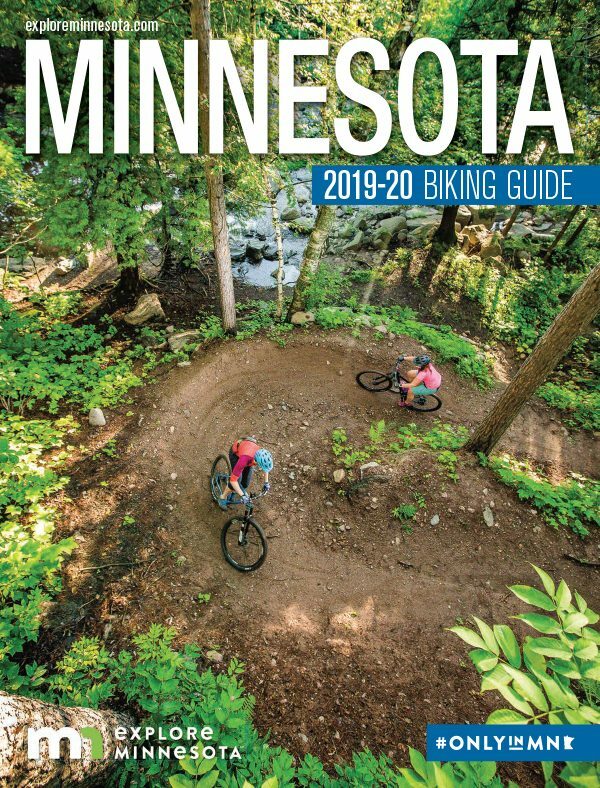 Consisting of the Lutsen-Tofte, Grand Marais, Gunflint Trail, and Grand Portage areas of the North Shore, Cook County offers a unique blend of scenic trails. Glide past snow-laden pine trees, along the Lake Superior shoreline, through remote Boundary Waters backcountry, past Laurentian Highlands terrain, or on trails lit up at night. There are more than 400 km of groomed cross-country ski trails in Cook County—the largest network in North America. Once you’re done exploring, relax in a cozy cabin, cottage, or lodge room (many with fireplaces), enjoy a wonderful meal, and see some live music before winding down for the night. Some resorts offer complimentary skis, ski rentals, and beginner lessons. 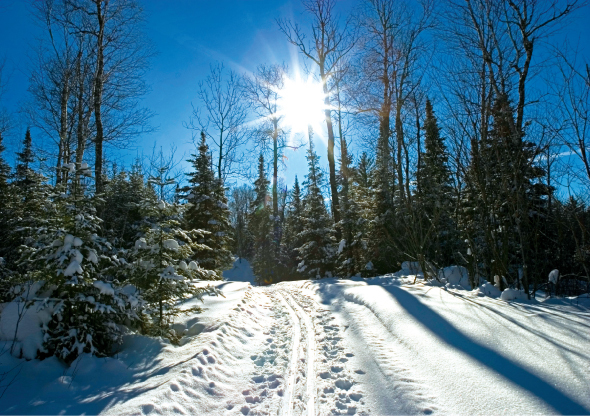 A Great Minnesota Ski Pass is required for those 16 and older to ski on any state park or forest trail (the fee helps cover the cost of high-quality trail grooming). If it’s too cold or too icy to ski, snowshoeing is a great alternative. 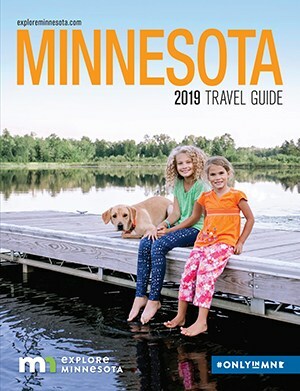 Ely—famous as a gateway to canoe country in warmer months—becomes a dogsledding paradise once the snow falls and the lakes freeze. A half-dozen outfitters in Ely offer day trips, or multiday dogsled expeditions into the Boundary Waters Canoe Area Wilderness. One of these outfitters, Chilly Dogs Sled Dog Trips, entertains visitors from across the globe, says Donna Hway, who owns the company along with her husband Jeff. 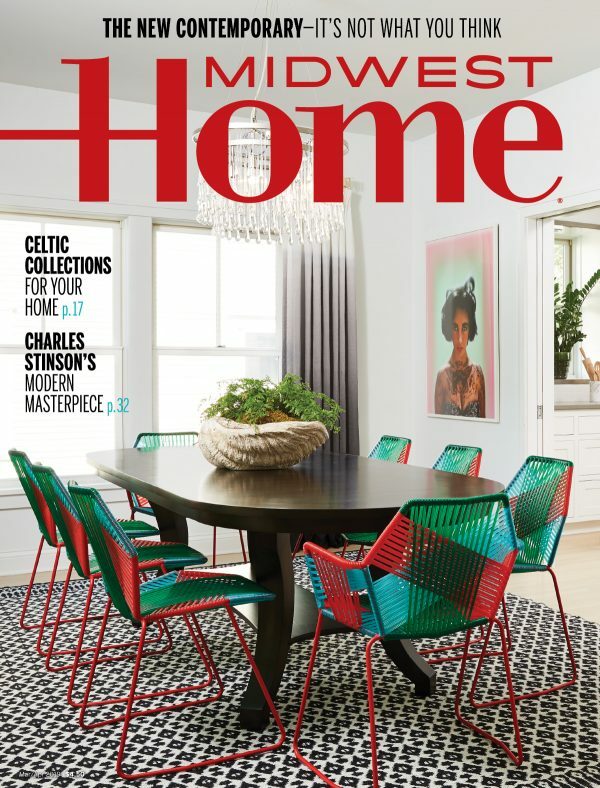 The majority of their customers, though, come from the Twin Cities metro. 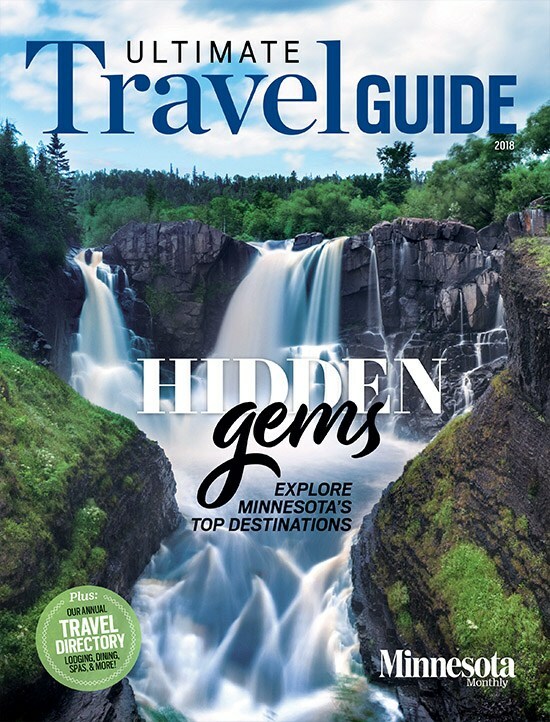 “They’ve discovered that Ely is the ideal getaway for a weekend of winter fun, in less than half-a-day’s drive,” Hway says. Participants as young as three months and as old as 95 have rode in or on a Chilly Dogs sled. This is what the dogs live for: The crisp air, the whisper of the sled runners, the glittering snow, and the thrill of running across lakes and through the forest. For more than 10,000 years, they’ve been bred to run, and that’s what they love to do. “Our professional mushers guide every trip, and they are masters at what they do—keeping the dogs running smoothly and making sure everyone is having fun,” Hway explains. The trails, she says, are “breathtakingly beautiful,” with a variety of terrain and forest cover to keep the scenery interesting. The family-owned company understands that many people are curious to try dogsledding but don’t want to commit to a long, cold expedition, so offer a half-day experience, a 2.5-hour option (a customer favorite), or a short, introductory option. When the trip is over and the dogs are back in their kennel, everyone gathers in the lodge to warm up by the fireplace, enjoy hot chocolate, and share stories. In addition to dogsledding, many visitors check out the International Wolf Center, excellent cross-country ski or snowshoe trails, boutique shopping in town, and local restaurants. Overnight visitors are encouraged to look up at the night sky in the hopes of seeing the surreal aurora borealis, or northern lights. Duluth’s Bentleyville Tour of Lights started out with one 40-foot storage container of lights, four pallets of hot apple cider, and 20 people coordinating and working the event. Today, there are 10 tractor trailers storing lights and equipment, they go through 10,000 pounds of hot chocolate, and more than 600 volunteers help keep the event going smoothly. People drive from all corners of the state (and neighboring states) for this impressive lighting display, the largest in the Midwest. 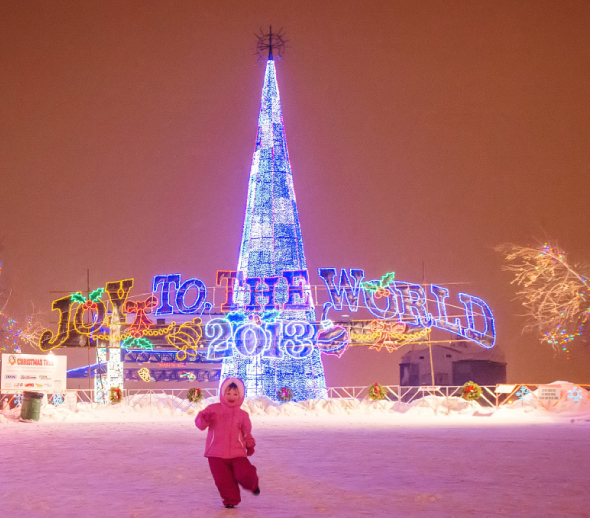 There are more than 3.5 million lights across 21 acres, a total of 27 fire pits, the always-popular Santa and Mrs. Claus on hand to greet the little ones, and free cookies, hot chocolate, coffee, and popcorn. 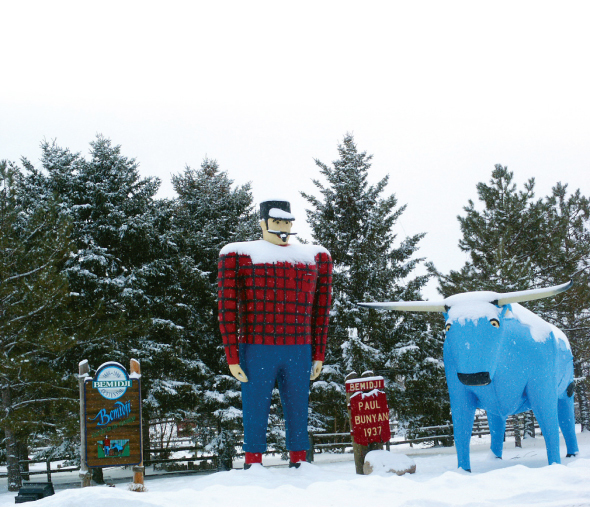 New this year is an ice sculpture event and a gigantic Paul Bunyan and Babe light display. “Bentleyville is one of those ‘must-see and experience’ events,” says Nathan Bentley, founder/executive director. The best part? This magical holiday event is free. Make an evening of it and take the Bentleyville Train from Fitger’s Brewery Complex. The Tour of Lights is from November 22-December 27, 2014, and is wheelchair-accessible, with paved walkways. Donations are accepted. Right now you’re more than likely not going stir crazy, but after a series of sub-zero temps, you might feel like you’ve had it up to here with the cold. Warm up at Arrowwood Resort, located two hours northwest of Minneapolis off I-94 in Alexandria. 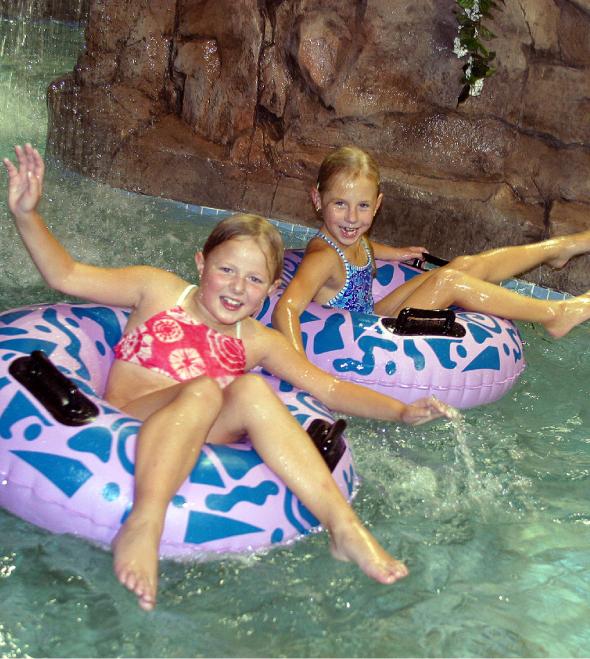 The 38,000-square-foot indoor water park gives the illusion of summer, complete with three four-story waterslides, a “Lazy River” inner tube ride, a tropical whirlpool spa, and plenty of excitement for the little ones. 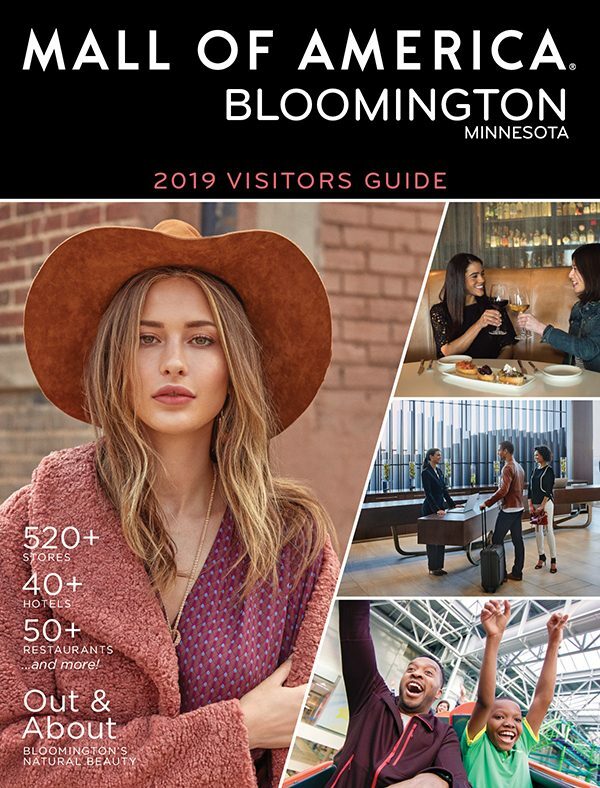 The fun continues with an indoor pool, whirlpool, fitness center, spa facility, on-site restaurants and lounge, and 14,000-square-foot indoor tennis facility, open year-round. If you do want to play outside, you can rent a snowmobile, cross-country skis, or ice skates, try ice fishing (Arrowwood provides the ice house, heat, chairs, and cards), hit the Snow Center sledding hill—sleds are available free of charge, or play broomball or hockey on the large Lake Darling rink. Andes Tower Hills, just 17 miles from the resort, offers downhill skiing, tubing, and snowboarding. Every weekend there’s a party somewhere on Mille Lacs Lake. That’s because, every winter, there are 139,000 acres of frozen water (typically frozen over by mid-December). That means 139,000 acres for car races on ice, snowmobile races on ice, windboards on ice, and an ice fishing contest just about every weekend. There are up to 5,500 ice fishing shacks on the lake any given winter. If you don’t own a fish house, you can rent one; if you don’t know the hot spots, you can hire a guide. If ice fishing doesn’t appeal to you, the Mille Lacs area is also laced with cross-country and snowmobile trails, offering miles of uninterrupted travel. If ice fishing does appeal to you, visit the area during the weekend of December 19-21 for the NAIFC tournament. The Saint Paul Winter Carnival was born back in 1886 as a way to celebrate winter, and over the years a story was created about a winter king who bestowed his blessing on the city. King Boreas, Queen of the Snows, the four wind brothers and their princesses, Klondike Kate, and Vulcan Rex and his crew uphold this legend every year. 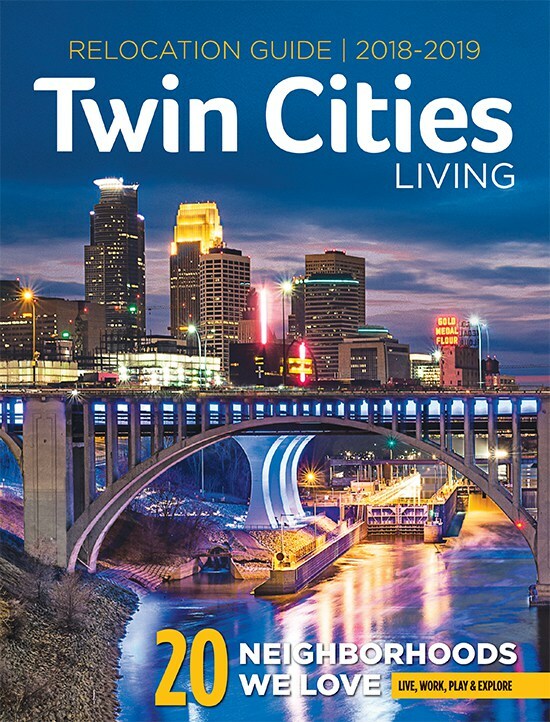 While visiting downtown St. Paul, check out the Science Museum of Minnesota, Minnesota History Center, Children’s Museum, or a game or concert at Excel Energy Center. You can also reserve horse and carriage rides or antique sleighs for holiday block parties, weddings, anniversaries, dinner parties, birthday celebrations, and more. Many Minnesotans were sad to see the last Holidazzle Parade march down Nicollet Avenue last year, but should be excited to hear the Minneapolis Downtown Council is bringing the Holidazzle Village and a European-style winter market—Minneapolis Christmas Market—to downtown Minneapolis from November 28-December 24, 2014. The two new events came after extensive brainstorming. According to Steve Cramer, president and CEO, Minneapolis Downtown Council, “Holidazzle Village featuring the Minneapolis Christmas Market is the idea that continued to rise above all others because of the unique opportunities it presents for bringing new experiences to the city while also offering something for everyone.” Holidazzle Village will include nightly choir and band performances, Holidazzle character sightings, photo opportunities, reindeer, storytime, and special events including winter fireworks, an interactive dogsled exhibit, glassblowing demonstrations, and a pop-up ice rink. The Minneapolis Christmas Market will be similar to Chicago’s open-air ChristKindlmarket, comprised of more than 30 huts in an Old World setting, featuring international and local vendors selling candy, ornaments, candles, handcrafted gifts, mulled wine, food and more. There will also be separate international days—highlighting diverse ethnic traditions in entertainment, food, and gifts—and an elaborate tree-lighting ceremony. The Depot Skating Rink in downtown Minneapolis has been named one of the top places in North America to ice skate by USA Today, MSNBC, and Fodor’s Travel. 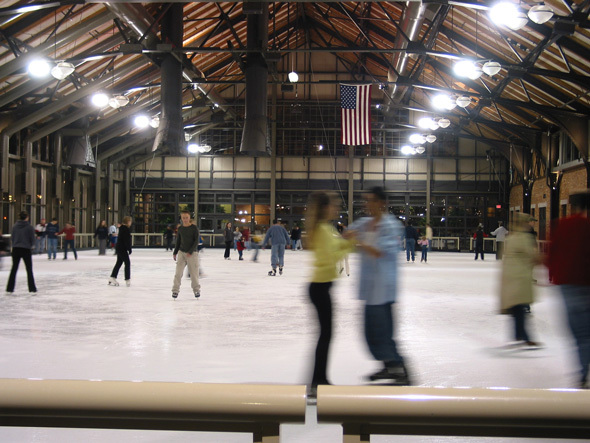 Unlike other well-known rinks (Rockefeller Center, for instance), The Depot has the “edge” as an indoor rink, housed in an 1899-era Minneapolis train shed, complete with a massive iron-truss ceiling. Floor-to-ceiling windows flood the rink with natural sunlight, so it feels like you’re outside, only without the natural elements. Families, couples, and both serious and amateur skaters share the rink (everyone fits right in). 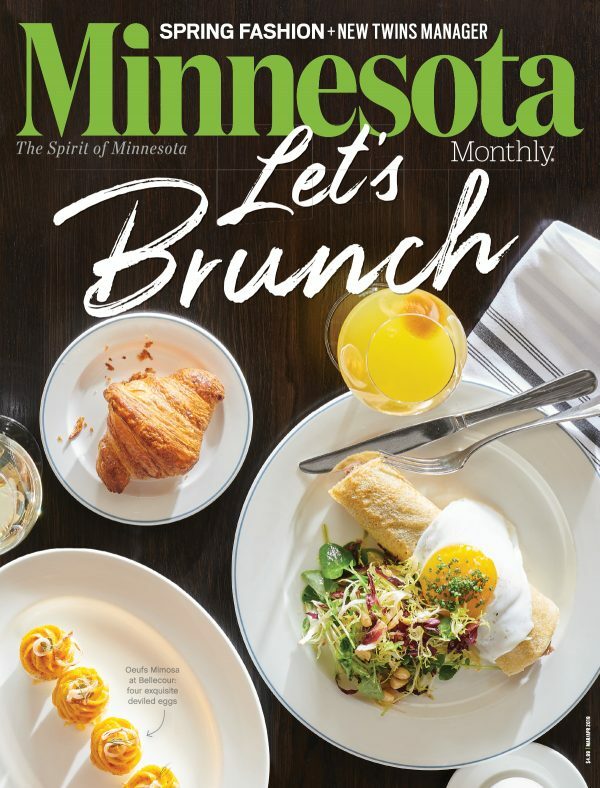 Before, during, or after skating, order hot cocoa and pizza or soup at the concession stand, or head to Charley’s Grill and Stone Arch Bar for a meal or drink, over at the adjoining Depot Renaissance Minneapolis Hotel. The Depot Skating Rink is open from November through March. The holiday production this year is the madcap romp, Every Christmas Story Ever Told (and then some), from November 21 through December 21. Three actors tackle every Christmas tale and tradition, carol, and character in just 90 minutes. “We truly believe that this play has something for everyone, and will be a delight for families of any size,” says van Meter. Winter is the best time to view both bald and golden eagles in the Upper Mississippi River Valley, when the blufflands become the eagles’ wintering territory. The National Eagle Center in Wabasha is part of an ongoing effort to better understand the habitat use and needs of these wintering golden eagles. 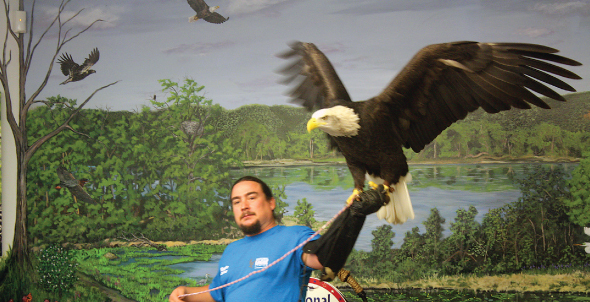 Not only can visitors view the elusive raptors in their natural environment, they can see them up-close during Live Eagle Programs at the center, when naturalists answer questions about eagle behavior, ecology, and recovery. Wabasha is also home to LARK Toys, one of the largest independent toy stores in the country, and the Grumpy Old Men Festival on February 28, 2015. The Mayo Clinic draws more than 700,000 people to the Rochester area on an annual basis. 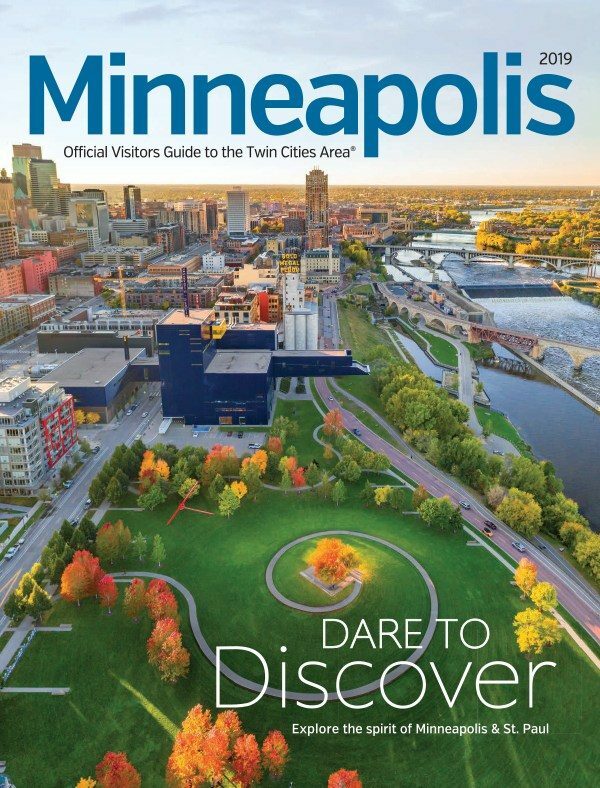 As of two years ago, those visitors can also visit the Minnesota Children’s Museum of Rochester, a satellite location of the original Minnesota Children’s Museum in St. Paul. The museum features separate play areas, an art room, and rotating exhibits, such as “Adventures with Clifford the Big Red Dog” through February 1, 2015. 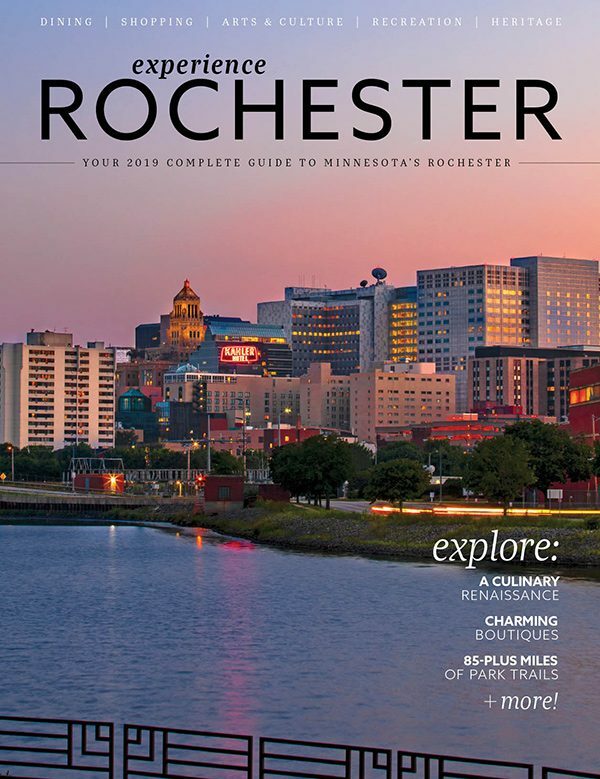 If you’re not traveling to Rochester—the third-largest city in the state, by the way—for a visit to the Mayo Clinic or the Children’s Museum, plan a road trip to see the Soldiers Field Veterans Memorial with the Memorial Wall and Walk of Remembrance, Peace Plaza, Silver Lake Park, Quarry Hill Nature Center (with snowshoes and cross-country skis available for rent), or the historic 38-room Mayowood Mansion—built by Dr. Charles Mayo back in 1911. In addition, there are more than 165 locally-owned restaurants and 5,000 hotel rooms in Rochester, and a variety of independent shops.